It has probably been a couple years since I have last used my fly fishing pole. I had bought a pole that breaks down nice and small to take with me backpacking. Since I haven't really been backpacking, I haven't taken my fly pole out either. I have never done well fly fishing in rivers. Someday I hope to get some instruction from somebody that knows how to fish a river well. What I have done well with is fly fishing in high altitude lakes and ponds. My wife and I went for a hike in Rocky Mountain National Park yesterday. Our goals were to visit a lake that we had only seen while it was frozen over, find a couple geocaches and I wanted to try and catch a Cutthroat Trout, which I had never caught before. The lakes that I enjoy backpacking to have plenty of Brook Trout, but I have never caught a Cutthroat in one of them. 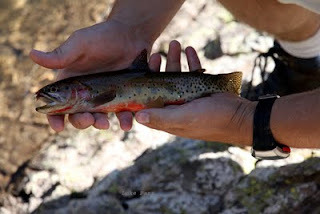 Rocky Mountain National Park is known for the Colorado native Cutthroat and seemed an ideal place to try and catch one. Of course, Rocky Mountain National Park is a common fishing destination and the fish there proved to be tougher to catch than some of the other lakes that I backpack to. My wife didn't want to wait too long for me to fish, so I didn't waste much time trying. It started out pretty slow, but switching to another lake gave me the opportunity to sight cast to fish cruising the shallows. The great thing about fishing calm mountain lakes is getting to see how the fish respond to your fly. The water was so clear that I could watch the fish approach the fly, then mostly ignore it. I kept moving along the shore to find new fish to cast to, but none of them seemed interested. I finally picked the right fly and the right fish and had one take the fly on my first presentation in that area. I brought the small Cutthroat in quickly for a couple pictures and let him go back into the cold mountain water. Though many of the high altitude fish don't grow to large sizes, they are some of the most beautiful trout you could ever catch. I tried a few more spots, but there weren't anymore fish that wanted to take a fly. We moved on to find our geocaches and finish the hike. We did decide to look for a couple geocaches on the way out, you can read more about those here. Your article is really informative.In near future i will try this spot too.By the way your article symbolize lots of unique concept .It's really great after read this.Waiting for your upcoming article.